A very eclectic first effort from this internet duo who have never actually met in person. Don Ramirez of Fresno, California and Scott Tatina of Harpers Ferry, West Virginia met on-line and discovered a mutual interest in progressive rock and fusion. They were also both musicians and decided to have a go at writing some material together. After months of e-mailing files back and forth, each adding the next idea or part, they discovered that they had recorded what used to be called an "album". With influences as diverse as Steely Dan to the fusion of Return To Forever to the progressive sounds of Happy The Man, "To the Power of Two" is a smorgasboard of delightful noises! Though this is all done with guitars & synths it does sound like a real band most of the time. Much of the CD reminds me of Kit Watkins' "In Time" album but there are a myriad of influences that keep things fresh. The majority of the disc is original material and the writing is very good indeed. They do two cover versions. First a fairly faithful rendition of The Kinks' "Waterloo Sunset" and then a killer version of "Starless" by King Crimson! 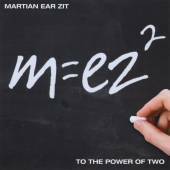 Notify me of updates to Martian Ear Zit "To the Power of Two"